This easy protein-packed dish has all the flavors of your favorite Margherita pizza without the added carbs! Chicken breasts are stuffed with a savory mixture of shredded mozzarella cheese and pesto, then roasted with fresh, juicy cherry tomatoes until they burst. Don't forget the Italian herb and Parmesan-spiked breadcrumbs! They create a crispy, addictive topping that you won't be able to resist. 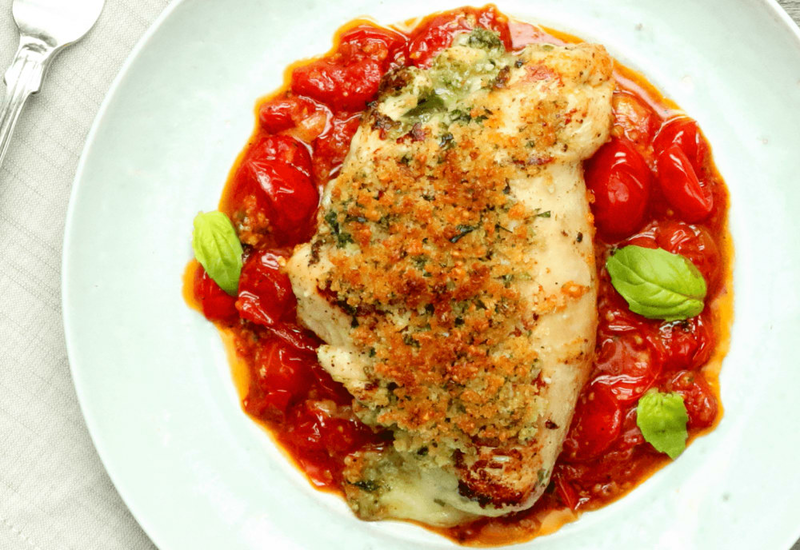 Using fresh basil leaves adds a distinct peppery taste, and creates a delicious texture and flavor contrast with the juicy chicken, crunchy breadcrumbs and tomato sauce. Pound chicken breasts to a uniform thickness to ensure even cooking. This technique is for two reasons: the chicken won't get over-cooked and dry, and pounding tenderizes the meat, resulting in juicy chicken. For a gluten-free dish, be sure to pick up gluten-free Panko breadcrumbs instead of regular. Per Serving: 1005 calories; 74g fat; 22.3g carbohydrates; 64g protein; 170mg cholesterol; 1272mg sodium. This dish was amazingly good. I love cooked tomatoes with pasta or meat. The pesto sauce inside the chicken made a really good combination with the tomatoes on the outside. This is definitely one of my favorite recipes on our Mealthy site. Will be making this again. Loved this recipe! So creative and even my kids ate it, and they never eat anything. My only complaint with this dish is that it's more of a Pesto Stuffed Chicken, not a pizza stuffed chicken. That said, the dish was packed with flavor, though go easy on Salt and pepper because the basil pesto is pretty salty. All in all this is a major yum. Packed with flavor! this dish caught me off guard with how delicious it was. The toothpicks were a little finicky but the end result is well worth all the steps. I'll DEFINITELY be making this again. This was a big hit at our house! The best of both worlds, chicken and pizza! The panko breadcrumbs was a nice addition. Healthier than wings and pizza, but same great flavor and fun! Anytime I can make stuffed chicken, it's win win. I added pepperoni to this dish and used fresh mozzarella cubes instead of shredded. Fantastic recipe, great flavor! Will definitely be making this again. The combination of tomato, basil, and pesto is incredible! This is one of the best recipes I've tried in a long time. So easy and delicious. The panko breadcrumbs is reminiscent of pizza crust. All around delicious meal! This dish tastes great! The mozzarella and basil are true to a traditional Margherita pizza. No fuss, no frills, just simply good food. Want to impress your date? This is the dish right here! I will definitely be making this again. Loved this! Will definitely be making again.